Another heirloom from my dad, this one. 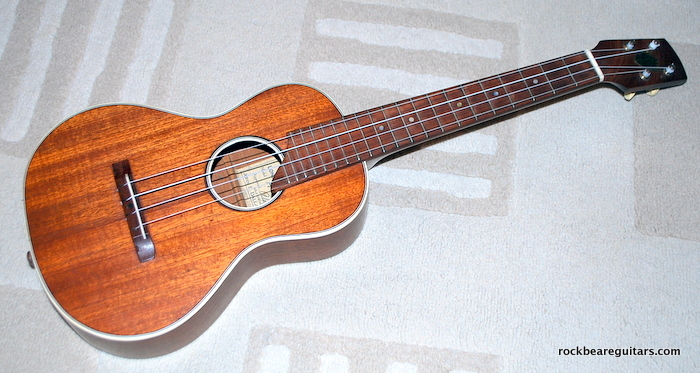 Quite big and long for a uke, sort of a large tenor size, so good for a guitarist’s fingers. Great sound and in really good shape for something that must be upwards of 75 years old. I play a bit of uke, more as I get older, but don’t know much about them, so any information will be very welcome. Nice model A ,I’ve just sold my beloved model B a few months ago.I also sold a C to the same buyer who is a dealer unfortunately.So he got it for buttons.As for the Keech model A I own one of these ukes and they are so nimble but an absolute pleasure to play.Mine isn’t as good nick as your one but still sounds good.When I first got it off eBay I was amazed at how light it was.Ive always been a fan of the Keech A after seeing George Formby play his in the Film No Limit.If you would like to see him playing it on YouTube put in George Formby TT races and for the second one put in George Formby in a little Wigan garden and you should see him play it.Have a look at the back of the neck where the tuning pegs are and you should see Alvin Keeches signature scoured into the wood as he signed every one of them in that way.You might have to let the light catch it as its a very subtle signature.If you ever decide to sell it, give us a shout as these ukes are getting harder to get hold of now and It would be nice to go one better as in condition wise.Thanks for posting the pic. Regards Jonathan. Thanks for your post Jonathan. Apart from this one, I’ve never seen another Keech, but then I’m a guitarist and haven’t been looking very hard. Given it’s a family heirloom, I’m unlikely to sell it. I will look for the signature. Do you have any pix of your you could share for my interest, and do you know of any web-based resource on Alvin Keech which I could look up?